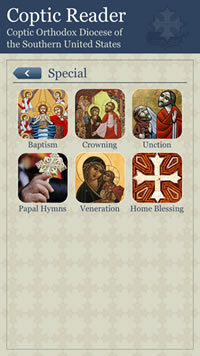 Coptic Reader is a mobile application developed by the Diocese and is supported on Android 2.2+ and iOS 6.0+ devices (iPhone and iPad). It contains the official Diocese translation of all the prayer books of the Coptic Orthodox Church in English, Coptic, and Arabic (Table 1). Coptic Reader has been specifically designed to harness the power of modern mobile computing technologies to deliver a seamless user experience (Images 1-3). Thousands of pages from dozens of books have been compressed and included in Coptic Reader allowing effortless access to all the prayers of the Church (Image 4 and 5). Images 1-3. 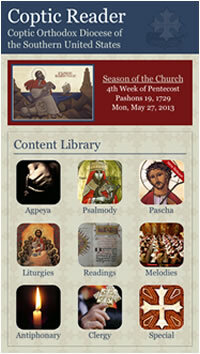 Showing Coptic Reader�s home screen and navigation panes in portrait and landscape. Image 4 and 5. Showing the Standard Offering of Incense in portrait and the day's Antiphonary in landscape orientations. 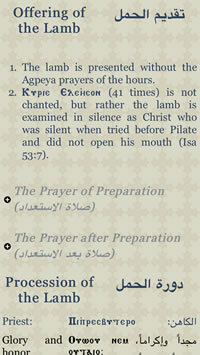 Coptic Reader is much more than just a digital version of all the prayer books. 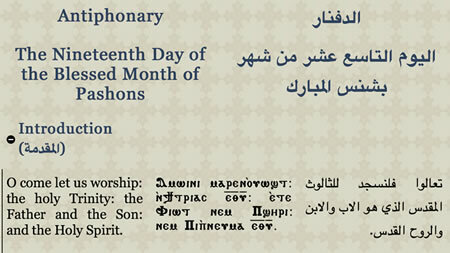 Unlike traditional books that present the prayers associated with each season of the year in an exhaustive list, Coptic Reader only displays the prayers/hymns that should be said on a particular day (Image 6). Once the date/time is set (Image 7), Coptic Reader will dynamically generate the prayers exactly as they should be prayed on that day including all the appropriate hymns and responses of the day (Image 8). Image 6. Showing the Rite of the Offering of the Lamb on Covenant Thursday (observe how the 41 Lord Have Mercies have been omitted and the corresponding note). Image 7. Calendar Menu, which contains three options: Live, Custom date/time select, and Select Occasion. Image 8. Automatically, the doxology for the Feast of the Resurrection is incorporated into the Offering of Incense prayers. Shown here in �Slideshow Mode�. What's more, Coptic Reader has the ability to display the correct responses for a particular saint(s) at the appropriate time. On a saint's feast day, all the appropriate responses for the saint will be automatically incorporated into all documents. 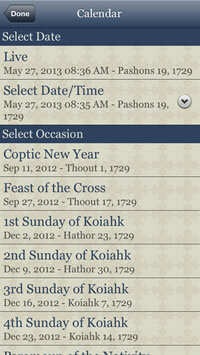 Additionally the Annual Commemorations Menu allows the user to control which responses for the saints are displayed even when it is not their feast day (Image 9). This can be used to display the responses for the intercessors of a church throughout the entire year (i.e., verses of the cymbals, doxology, Gospel response, intercession hymn, Praxis response, or Communion melody). Image 9. 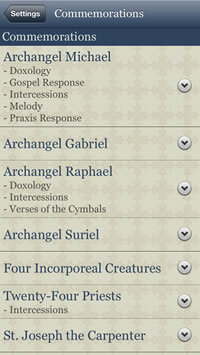 Annual Commemorations Menu: allows the user to customize which saint or archangel commemorations will be shown in doxologies, hymns, responses, and other prayers for your church's intercessors. A special section just for clergy is present for quick access to frequently prayed litanies, responses, and Psalms (Image 10). Image 10. Special section for Clergy to afford quick access to frequently used prayers, litanies, and Psalms. When placed into "Slideshow Mode", Coptic Reader takes on a new feel and its contents are displayed much like a PowerPoint Presentation (Image 8). Slideshow Mode is ideal for presenting on a projector or television and supports the use of remote presenters. 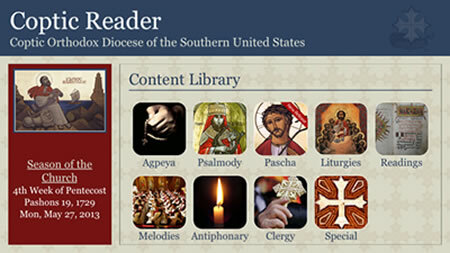 Coptic Reader can be installed on any Android device with Android 2.2 or higher, and may be downloaded from the Google Play Store here. Coptic Reader can be installed on any iOS device with iOS 6.0 and higher, and will SOON be available for download from the iOS App Store here.